Seth Schenck and Ross Seitter join some of New Haven's greatest players in the record books with career stats. NEW HAVEN, Mo. 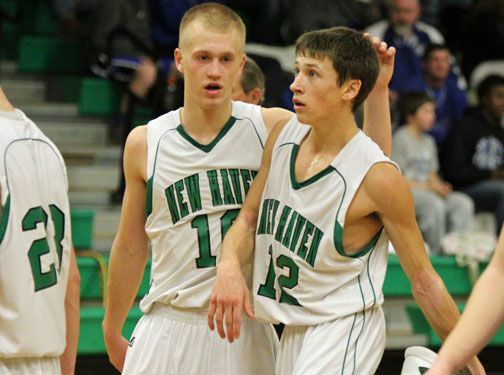 - Kyle Ruediger and Seth Schenck helped lead New Haven to their first District Championship since 2011, giving Coach Ray Steinhoff his 550th career win and 11th District Championship. Ruediger and Schenck led New Haven to an overall season record of 20-9 and the 13th time Steinhoff has won 20 or more games in a season. PARK HILLS, Mo. - After winning their first district title in two years the weekend before New Haven rode into Wednesday’s Class 2 State Sectionals on a five game winning streak. 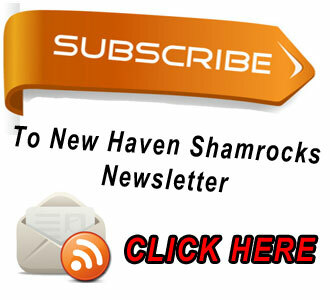 Despite junior Kyle Ruediger’s team high 24 points and senior point guard Seth Schenck’s 12 points it was Advance’s senior guard Lane Below who scored a game high 28 points that ended the Shamrock’s season in a 63-52 loss. The final score does not reflect how closely the two teams battled as New Haven trailed by one with 4:45 left when a call that could have gone either way was made would end up being a pivotal changing point in the game. Seth Schenck drains a big three putting New Haven up by ten (34-24) after Elsberry scored back-to-back buckets and pulling with in seven with 1:48 left in the third. (Photos by Kelly Hoffmann) Photo slide show below. NEW HAVEN, Mo. - “The will to succeed is important but what’s more important is the will to prepare.” -Bob Knight. Coach Ray Steinhoff’s plan on how to contain Elsberry’s 6’9’’ forward Kenny Lesley who came in averaging 23 points per game was executed with near perfection. 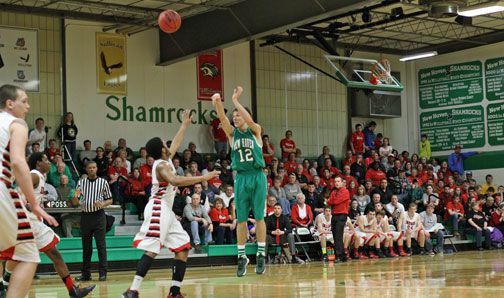 The Shamrock's defense held Lesley to just two points in the first three quarters. New Haven, Mo. - In front of a packed house the New Haven Shamrocks’ boys and girls both advance onto Wednesday’s Class 2 State Sectionals at Park Hills, Mo. The Lady Shamrocks kicked off the night with a 44 - 32 win over Elsberry, led by Rachel Steinhoff’s game high 22 points and her team’s third straight district title, improving to 20-8 on the year. In the boys game it was classic New Haven basketball led by senior point guard Seth Schenck with a game high 21 points as the Shamrocks win their first district title since 2011, knocking off Elsberyy 55-44. 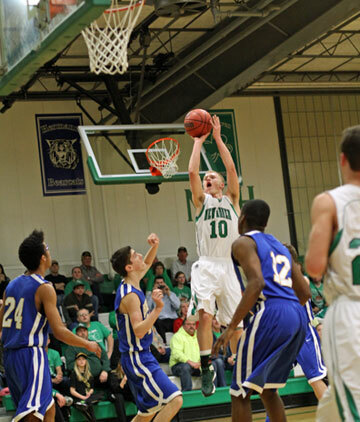 Kyle Ruediger elevates above his defender to knock down a 12-footer during the first half in their win over Crossroads. New Haven, Mo. 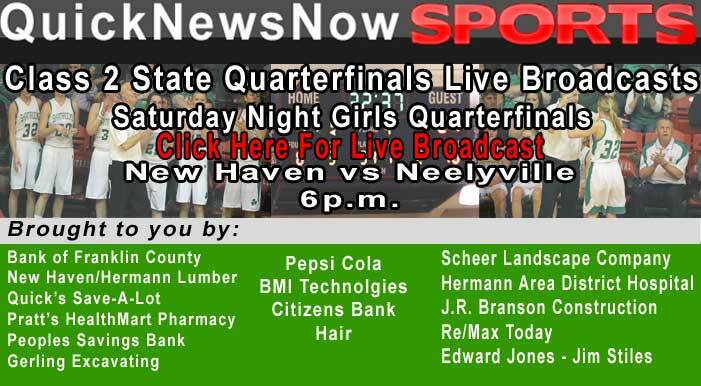 - It will be a packed house Friday night at New Haven as both New Haven and Elsberry’s boys and girls will battle it out for District Titles. With New Haven’s win over Crossroads 48-27 and Elsberry knocking off Kingston 64-19 in last night’s semifinals, they join their girl’s teams after the Lady Rocks defeated Barat Academy 50-21 while Elsberry cruised passed Crystal City 63-43 in Tuesday night’s girl’s semifinals. Tomorrow night Elsberry’s boys will look to defend their district title after defeating Crossroads last year, while the Lady Shamrocks will be going for a three-peat. Tomorrow night will also be the seventh straight year that the Lady Shamrocks have played for a district championship. 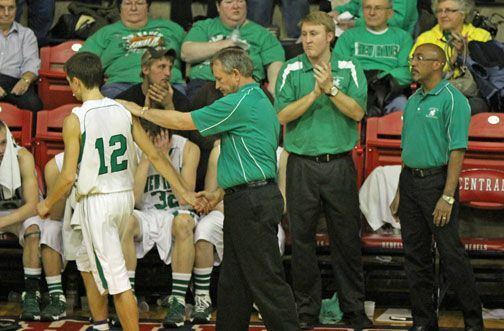 In his 30th year as the New Haven Boys Head Basketball Coach, Ray Steinhoff will have coached his team into a district title game for the 22nd time in hopes of winning an 11th career district championship and the first time since 2011.